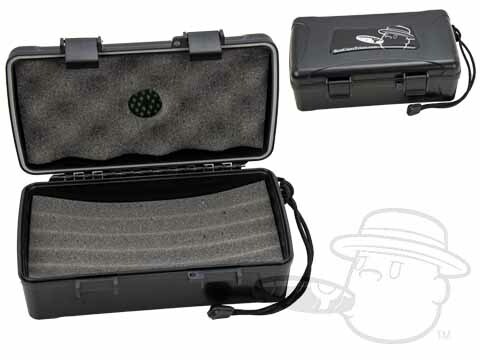 Bestcigarprices Travel Cigar Protection Case #10 is rated 3.8 out of 5 based on 1 customer ratings. There seems to be some foam oasis in the lid of this travel humidor. Should propylene glycol be added to it, and if so, how much and how often? We would recommend using the propylene glycol solution with the humidifier that comes with the X-treme Cigar Protection Case #10. The case is plastic, so it does not "breathe," and the propylene glycol reduces the chance for mold. To fill the humidifier, remove it from the case and slowly pour propylene glycol solution into the humidifier until it will not absorb any more. Wait a few minutes, then shake out the remaining solution. Towel it off to make sure the unit is dry, and then it should be ready to place back into the case. You shouldn't have to do this very often, however, because the X-treme Cigar Protection Case #10 has a very effective airtight seal.